The Sweet Fanny Adams album also featured compressed high-pitched backing vocal harmonies, which was a trend that continued on all of Sweet's albums. Sweet, and fellow U.K. band Queen, were both recognised as one of the main exponents of high-pitched harmonies during the 1970s. A second album was released during 1974, called Desolation Boulevard. One of the tracks off this album was a cover of The Who's "My Generation". Sweet received public praise from The Who's guitarist, Pete Townshend. Sweet also frequently cited The Who as being one of their main influences. At Townshend's invitation, Sweet were invited to support The Who at Charlton Athletics' Football Ground. Unfortunately, in June of 1974, Brian Connnolly was attacked before the group's going on as support, and he took time out from singing as his throat was badly bruised. In 1975, RCA released an album titled, The Sweet Singles Album, which was only released in Australia and New Zealand. This LP featured hard rock B side single recordings, including the hit singles "Ballroom Blitz", "Teenage Rampage", "Blockbuster", and "Hell Raiser". In 1975, Sweet's first self-written and produced single, "Fox on the Run", was released worldwide and instantly became their biggest selling hit, reaching number one in several countries. During 1976, Sweet attempted to gain popularity in America by promoting their Give Us A Wink album with a heavy schedule of more than fifty concert dates. During one appearance, Sweet played All Right Now with Ritchie Blackmore in a tribute to mark the death of Free guitarist Paul Kossoff. The 1976 and 1977 years featured Sweet as an album oriented pop-metal act. Albums such as Give Us a Wink and Off the Record were undoubtedly Sweet's heaviest studio albums. Indeed, Sweet's 1976 top twenty hit, "Action", was the group's hardest rocking hit single. Sweet split from RCA in late 1977. The first album for new label Polydor, Level Headed, found Sweet experimenting by combining rock and classical music, an approach similar to U.K. band ELO. Sweet undertook a successful British tour in early 1978. "Love Is Like Oxygen" was their last U.K. top ten hit in 1978. In February 1979, Brian Connolly left the band under acrimonious circumstances, and neither he nor the band fully recovered. Brian was particularly suffering from the effects of substantial alcohol intake. He also suffered cardiac arrests at the height of his excess. 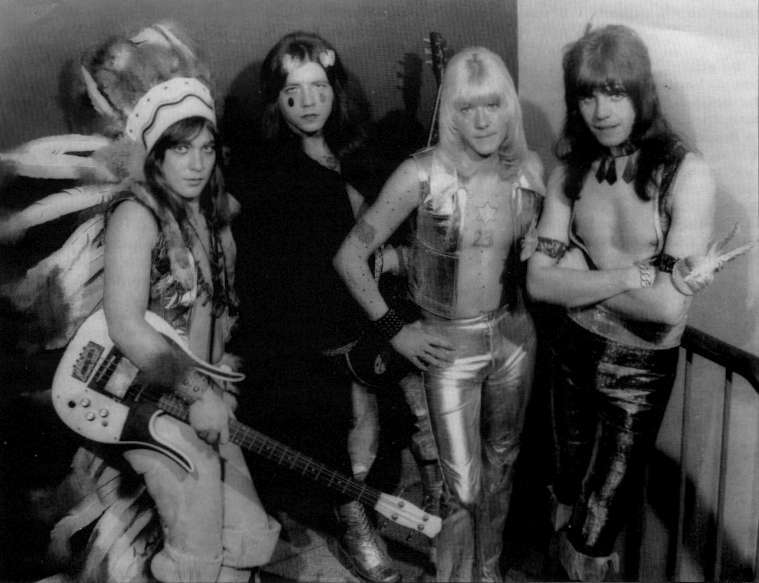 Before Brian Connolly announced his departure in February 1979, his vocals were erased from the recorded material for the ensuing Cut Above The Rest album, and Sweet continued on as a trio, with Scott and Priest now both handling lead vocals. Keyboard player Gary Moberley completed the four-piece line-up. Three more studio albums were recorded between 1979 and 1982, the year in which Sweet disbanded. In 1988, Connolly, Scott, Priest, and Tucker briefly reformed to record music for the first time in seven years. Some reworked studio versions of "Action" and "Ballroom Blitz" were recorded in Los Angeles. During the same year, "Blockbuster" was sampled by The Timelords (later The KLF) as part of their number one single, Doctorin' the Tardis. The track also featured samples of Gary Glitter's Rock And Roll (Part 1) and the Doctor Who theme, and reached number one in the UK charts on June 12. In 1990, all four members were again re-united for the promotion of a video, titled Sweet's Ballroom Blitz. This UK release, which contained UK television performances from the 1970s, including current-day interviews, was released at Tower Records, London. In 1993 Def Leppard released a successful cover version of Action. Brian Connolly died from liver failure in 1997, aged 52, having been content in his final years to appear in retrospective documentaries to demonstrate the damage he had inflicted upon himself. Mick Tucker died in 2002 from leukaemia, aged 54. Sweet's two remaining members are still active in the music industry. Andy Scott currently continues to tour with Andy Scott's Sweet, while Steve Priest is now a session musician in Los Angeles.